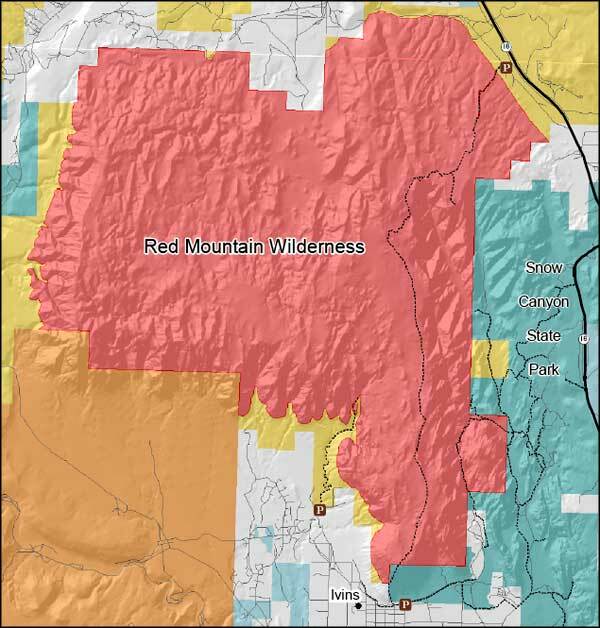 Red Mountain Wilderness contains about 18,689 acres, most of which is included in the Red Cliffs National Conservation Area. 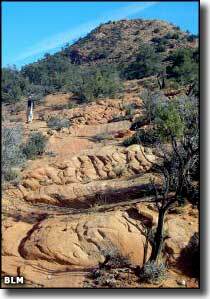 Red Mountain itself is a huge block of eroded Navajo Sandstone, surrounded by an expanse of red sand and slickrock. Snow Canyon State Park wraps around the eastern and part of the southern flank of Red Mountain Wilderness. The western boundary runs along the Santa Clara River. Most lower areas on the property that aren't just solid rock sport a mix of Mohave Desert vegetation. In the upper areas you might find Utah juniper, pinyon pine and a mix of sagebrush, scrub oak and mountain mahogany. Cottontail, jackrabbit, kit fox, bobcat, mule deer, mountain lion and coyote are often seen on the property, as are a vraiety of raptors, songbirds and hummingbirds. There are only a couple hiking trails on the property and those are often shared with folks on horseback. In some areas you can peer into Snow Canyon State Park and get some great views of the black basalt overlying the layers of red and white Navajo sandstone. From other high points on the property you can see the Pine Valley Mountains to the north, Zion National Park to the east, the Virgin River valley to the south and the Beaver Dam Mountains to the southwest. 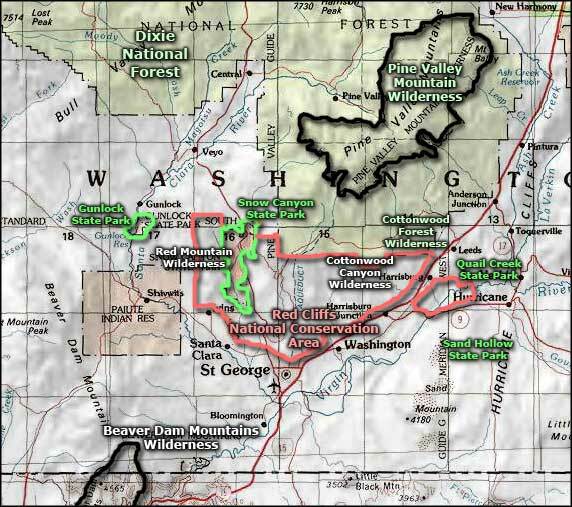 Red Mountain Wilderness was a designated Wilderness Study Area for many years but finally became a reality with passage of the Omnibus Public Lands Management Act in 2009.